Globalization and the consistent growth of the Chinese economy has greatly influenced the global shipping industry. The Chinese government’s heavy investment into infrastructure has projected strong and continuous economic growth. The Chinese economy can be a good global market indicator especially when considering a shipping container investment. 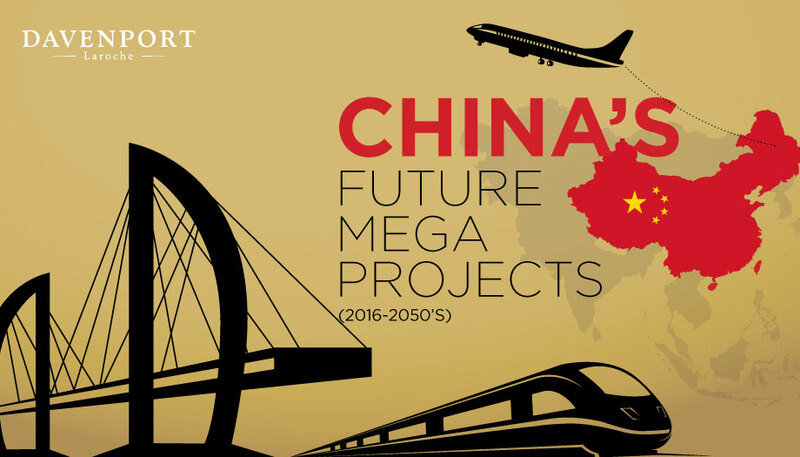 Below outlines a more detailed view of China’s future megaprojects (2016-2050’s). China plans to merge Beijing, Tianjin and Heibeiji into one megalopolis by using advanced communication services, new subway lines and better highways. The Jing-Jin-Ji high speed rail network is one of the mega infrastructures involved in this plan. The high speed train will be able to reach a peak speed of 297km/h and urban areas that were previously confined by the 97km/h speed of a car or subway line can now greatly expand. China’s idea of moving 45 billion cubic meters of water each year from the wetter south to the dryer north include 3 canal projects. The eastern canal will begin at the Yangtze River and snake 1152km uphill with the help of more than 20 pumping stations to the reservoirs in Tianjin. The second canal will flow downhill 1263km from the Dongjiang Xu reservoir on the Xiangjiang River across the north China plain to Beijing. The big western line canal will divert water flowing into the Yangtze River and send it to the Yellow River instead. The world’s largest and busiest airport, Beijing Daxing International airport, is soon to open in 2018. The airport’s main terminal will sprawl over 7.5 million square feet and will be able to handle a maximum capacity of 130 million passengers a year. Its unique starfish design was created by Zaha Hadid Architects to provide an exceptional passenger experience with minimal walking and increased activity. With a construction cost of 13 billion USD, the new mega airport could have as many as 9 runways, where 8 are for civilian use and 1 for the military. China also plans to include a dedicated high speed rail line that will connect the airport to the rest of Beijing’s transportation system. The goal for China’s world-class high speed rail network is to build a system with more than 35,000km worth of tracks. This system enables commuters to travel to work from a further distance without the time and traffic constraints of a car. High speed rail will become the key to urbanization. China’s rail system is considered the safest mode of transportation in the entire world with one of the longest single service tracks at 2400km long from Harbin to Wuhan, with a peak speed of 430km/h. Having successfully linked the entire country with high speed rails, China now looks to do the same globally. It is currently building systems for Turkey, Saudi Arabia and South America and is bidding on projects in Russia, Brazil, Myanmar and the United States. The two cities across the Bohai Sea, Dalian and Yantai, will be the final destinations for the world’s longest underwater tunnel. At 122km long, the 42 billion USD project will pass through 2 deadly earthquake fault lines and will be longer than the Seikan and Channel tunnels combined. The project’s purpose is to slash the 8 hour drive between the 2 cities to under 2 hours. It will also connect China’s isolated northern rust belt with its wealthy east coast, adding an additional 3.7 billion USD to the economy each year. This experience could establish the Chinese as the preeminent submarine diggers in the world and would be a serious practice run for far more ambitious potential mega projects like connecting China to South Korea. China’s plan for a 17 billion USD mega bridge project across the Pearl River Delta will cut the 4 hour drive from Hong Kong to Macau to 45 minutes. The 6 lane multi part bridge is an incredibly complex project that includes cost and construction agreements between mainland China and its special administrative regions of Hong Kong and Macau. The Hong Kong – Zhuhai – Macau Bridge must be able to withstand typhoons and will have a 28km long underwater tunnel to avoid cutting off one of the world’s busiest shipping routes into Hong Kong. Another mega bridge will be built a few miles to the north across the delta to include Shen Zhen. These bridges are to lay the foundation for China’s second megalopolis, an urban area that could potentially exceed 100 million residents. It is clear that China’s ambitious plans to significantly upgrade infrastructures domestically and globally will have a profound effect upon their economy. As China seeks to implement their plans, the impact of such significant investment will directly affect the worlds shipping industry. Investors will expect to see a positive correlation between Chinese investment and their container shipping investments. Get in touch with Davenport and we will show you how owning containers will give you access to the world’s leading hard asset investment.